This book is an excerpt of the beginning of, “Book 3, Calvin’s Institutes of the Christian Religion, 1560 French edition.” It is 140 pages long. 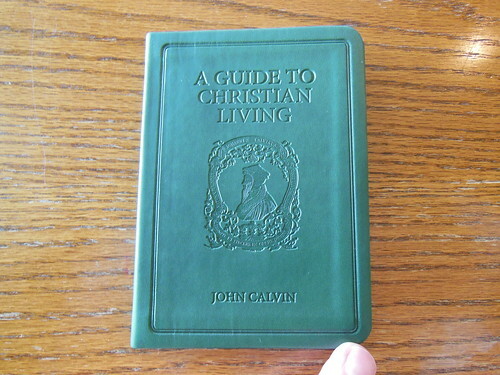 It has a short introduction providing some background information about John Calvin and his, “Institutes.” It also explains Calvin’s purpose in writing, “Book 3” His purpose is also made clear in this book’s title. 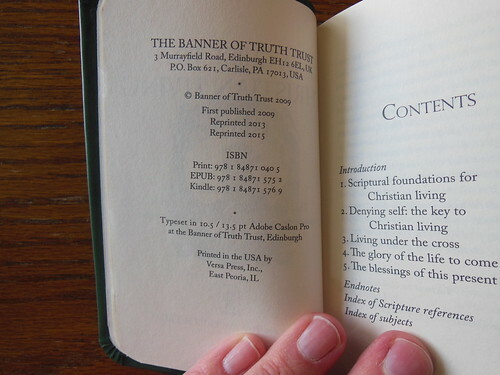 At the end of the book are, the endnotes, and indexes of scripture references, as well as subjects. This book is published by The Banner of Truth Trust. It is printed by Versa Press Inc., of East Peoria Illinois USA. The font is a very legible 10.5/13.5 Adobe Caslon Pro typeset. It is available in print, e-pub, and Kindle. I found the paper to be very thick and easy to highlight. It is covered in green faux leather. The cover is decorated with a perimeter channel, image of Calvin, and the title stamped in it to resemble tooling. The spine looks to be sewn and glued. 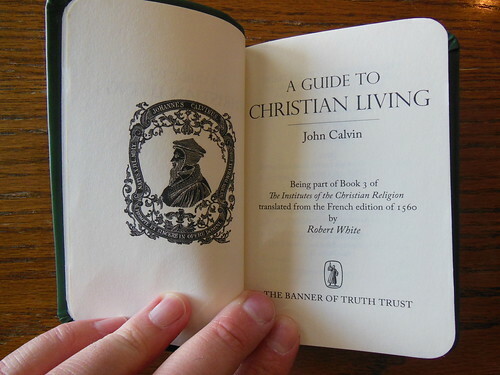 It has the title stamped parallel to the spine, John Calvin under that, and The Banner of Truth’s logo at the foot. 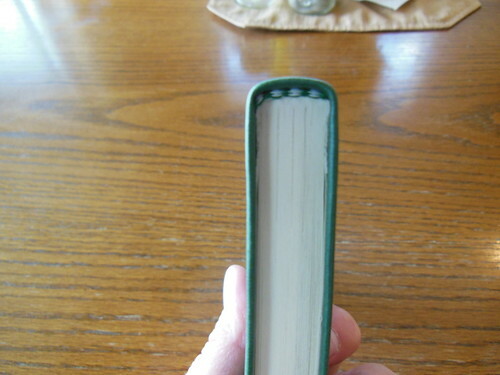 Overall I found the book to be well constructed and easy to read. If you are familiar with the works of Calvin, you’ll recognize this when you start reading it. Unlike many of his Latin works that were translated into English, this translation seems less formal and verbose. Due to that fact it lends itself to devotional reading. It works well for that purpose, and gives you something to ponder while you go about your day. I found myself nodding my head in agreement several times and wondering what other sections of Calvin’s works could be arranged as devotionals. It was very refreshing to read something scriptural in Modern English. As of late, the choices have been dismal. Most devotionals in Modern English are full of extra-biblical revelations, or pseudo-self-help drivel. People have been feasting on cotton candy theology and as a result are malnutritioned. Reading something that makes you truly consider what is being communicated is stimulating. You have to engage your head and your heart, not just one or the other. People say that Calvin is to dry, but if you read his work, you will see his passion for God come through. My copy of Spurgeon’s, “Morning and Evening” is a bit too large to carry with me to work. This book is much smaller. I can fit it in my pocket. The paper is very thick and heavy, not like Bible paper at all. Highlighting and underlining works well. I was underlining and highlighting sections to quote on social media later on. This way you don’t have to mark up your nicer complete volume of Calvin’s Institutes. This little book, unlike many devotionals, is more durable it stands up to being carried about. I recommend this for personal devotions as well as a gift to the newly born again. I think it will aid them in getting their foundational doctrines in order. It can be purchased directly from The Banner of Truth, or you can purchase it from, Christianbook.com as well as Amazon.com. To see all the pictures I took visit my flickr page.